After dropping videos for "The Weekend," "Doves In The Wind," and "Supermodel", she nailed yet another creative visual. ThWe swear every video makes us love her and her freshness even more. 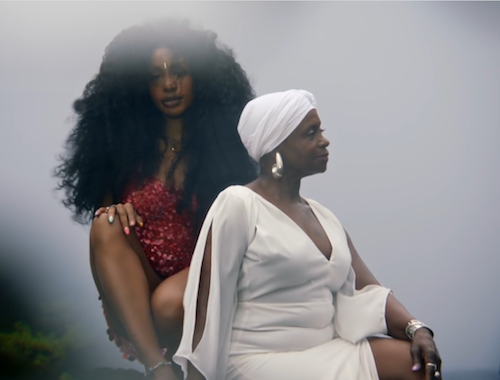 SZA grabbed Karena Evans, the 22-year-old filmmaker behind Drake's "Nice For What" and "God's Plan" videos, to serve up some magical visuals for her track "Garden". Donald Glover/Childish Gambino returned the favor of making a cameo, after she made one in his "This Is America" video. He plays the Adam to her Eve as the two frolick on beaches, in trees and other greenery as they chase each other in some ethereal faraway place. And when her real life mom, Audrew Rowe, shows up, things get even more beautiful. PREVIOUS: FINAL COUNTDOWN! Meghan Markle Is Officially The Duchess Of Sussex - See The 22-Page Program, Decor, Cake & Everything We Know About The Royal Wedding Dress! NEXT: Prince Charles Will Walk Meghan Markle Down The Aisle, And We've Got The Tea On Meghan's Mom's Tea With The Queen!